Wrangell-St. Elias entrance, Moose sighting in Chitina, Bonanza Mine hike. Getting there: The park headquarters and visitor center at Copper Center are about a 4-hour drive east of Anchorage. Only two areas of the park are accessible by car, Nabesna and McCarthy, and both are at the end of lengthy gravel roads. We chose McCarthy because it offers more activities and lodging. McCarthy is another 3.5 hours from the Visitor Center. The only other way to get to the interior of the park is to charter a plane into one of the small airstrips. Wrangell-St. Elias National Park is enormous. It is by far the largest park in the United States, and at 13 million acres is as large as Switzerland. Approximately 70% of the area is preserved as wilderness. Combined with the adjacent Glacier Bay National Park and Canada’s Kluane National Park, it creates the second largest contiguous protected area on the planet after Antarctica. Four mountain ranges converge in the park, the Wrangells, the Chugach, the St. Elias Mountains and the Alaska Range. 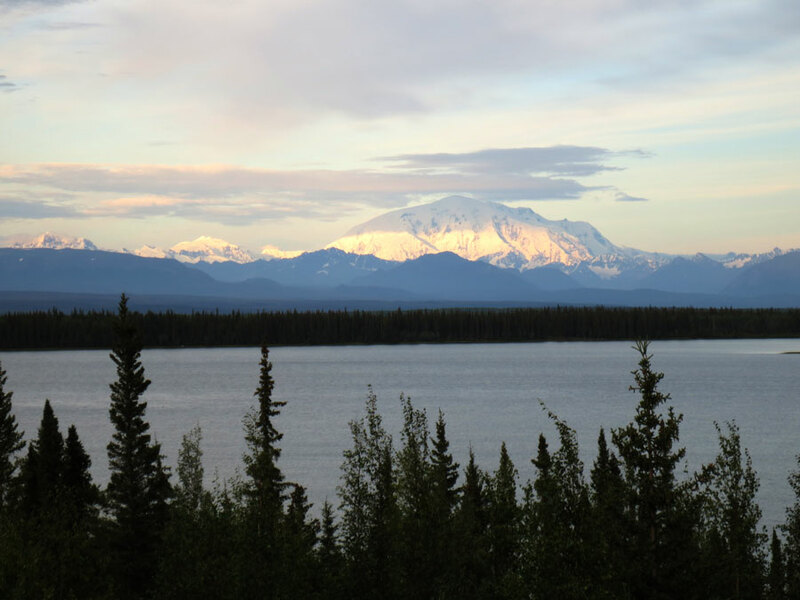 Nine of the sixteen tallest mountains in the country are found in Wrangell-St. Elias. The overall landscape is a seemingly never-ending scene of mountains, glaciers and rivers. A good starting point is the gold rush-era settlement of Copper Center, where the main visitor center is located. We stopped by the excellent, new facilities on our way from Denali National Park. There are the usual interpretive displays, a movie and some short trails nearby. We walked the Boreal Forest Loop that gives a good overview of the Copper River Valley and the mountains beyond. We also took some time while in Copper Center to check out the George Ashby Alaskan History Museum. It’s a couple of small log cabins filled with historic documents and artifacts used by mining prospectors. It’s worth a stop if you have an interest in the gold rush. I have a particular interest because I have some ancestors who participated in the 1898 Klondike gold rush in this region. Copper Center is where many of the people who came over the Valdez Glacier route passed through. I knew my family had set up camp a ways down the Klutina River because I have copies of their letters home. The man at the Museum gave us directions to a trail that runs alongside the Klutina so we headed that way. It felt cool to stand in the area where my ancestors had been over 100 years before. View of Willow Lake from Richardson Highway. Mt Blackburn in the background. Our first night’s lodging in the area was not inside the park, but located a short drive south of Copper Center. It turned out to be our favorite overnight stop of the entire trip. Willow Lake Bed and Breakfast is a guest cabin built by former Chicagoans Jim and Linda Marchini next to their personal home right on the shore of Willow Lake. The construction is incredible and there is an album full of photos documenting the process from the cutting of the trees to the carving of the the ridge pole. One feature missing is a room key… you simply don’t need to worry about locking things up when you’re this far off the beaten path, it’s quite refreshing. Dining options in the area are obviously sparse, but Linda recommended the Tonsina River Lodge down the road for some Russian cuisine. Back at the cabin, we amused ourselves with some wine, an electric mosquito zapper and a view of gorgeous mountains. What more could you need? In the morning Linda prepared delicious sourdough pancakes while Jim took us on a tour of their amazing home and showed off his extensive taxidermy collection. The filling breakfast was perfect preparation for the long day we had ahead of us. Off to McCarthy! Flat tire on McCarthy Road. We most likely picked up the shard in a construction zone on the Edgerton Highway. Footbridge at the end of McCarthy Road. Continue on foot. About an hour south of Willow Lake is the town of Chitina, the end of the well-maintained roadway. At the edge of town, you enter the McCarthy Road, a 62-mile gravel route that heads into the center of Wrangell-St. Elias. We knew it was notorious for rough going, but it seemed like a joke when our Explorer announced “Low Tire Pressure” literally the moment we drove onto the road. We had been on gravel for 5 seconds, so clearly it must be mistaken. We hopped out and all the tires looked fine so I cautiously continued up the road. A Subaru was limping back toward Chitina with a destroyed tire flopping on its rim. Not a good sign. After about 5 miles we arrived at the first river overlook pullout and jumped out to take in the view. That’s when I heard the telltale hiss of air leaving the rear driver’s side tire. We had a 3:30 tour of the Kennecott copper mill scheduled, so there was not a lot of time to spare, no pun intended. 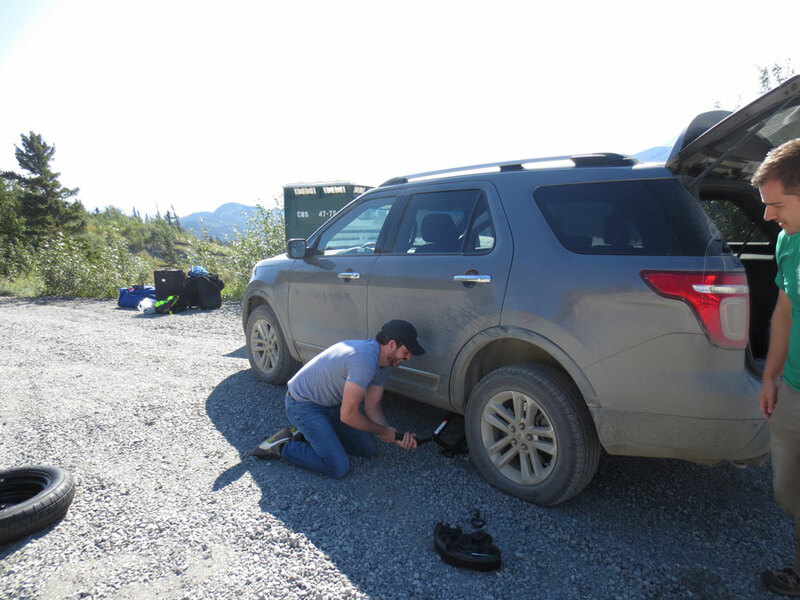 We performed a quick evacuation of all our luggage, popped on the tiny donut spare (thanks a lot Ford) and turned back to Chitina where Nick had spotted a tire repair shop. If there’s a million dollar idea, it’s to open a tire repair shop at the end of the McCarthy Road. Some guy patched it up in two minutes and we were on the road again. The silver lining of the flat tire was that we saw the one and only moose of our entire trip wading in a pond as we returned to Chitina. Plus we get to tell the story about the time we got a flat tire in Alaska, which may top our “almost running out of gas in Maine” story. Without any further incidents, we made it to the end of the McCarthy Road, where you have to park your vehicle, walk across a footbridge and catch a shuttle van into town. You’ll be happy to know that after all that action we made it to Kennecott just in time to make our tour. The neighboring towns of McCarthy and Kennecott are smack in the middle of the national park and provide the best options for activities. They are truly remote, probably the most remote place we’ve ever visited, and have a lifestyle all their own. Their boom-and-bust history revolves around the fortunes of the early 20th century copper mining operations in the area, and now they are primarily tourism driven. 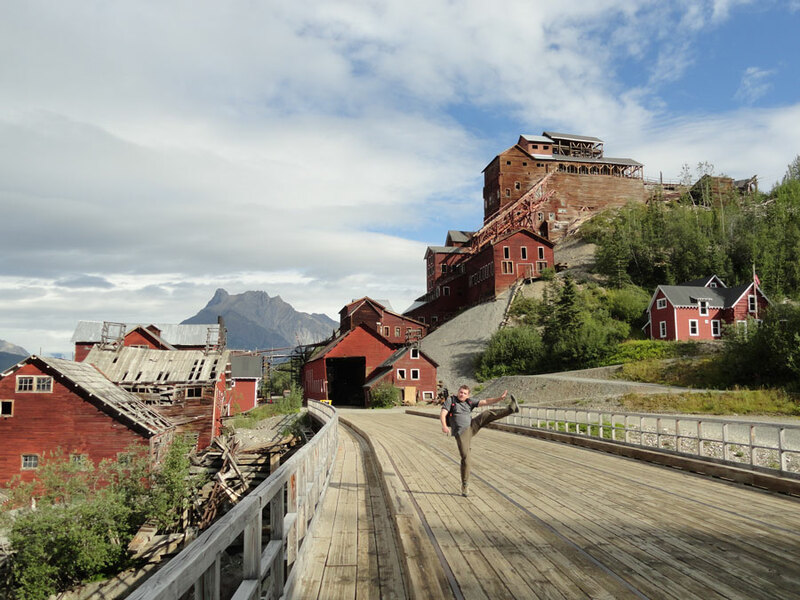 As such, our first planned activity was a St. Elias Alpine Guides tour of the former company town and National Historic Landmark of Kennecott. Three times a day their knowledgable guides take guests through various buildings that date from when the town was a noisy, bustling industrial area. The National Park Service maintains many buildings in various states of decay, stabilization and restoration. The centerpiece is the surreal-looking mill building. This all-timber, 14-story construction houses the remnants of the giant ore processing equipment that refined the raw material coming out of the mines high up on the mountains. Raw ore from five mine sites was hauled down the mountain on a ski lift-like tramline, dumped into the top of the mill building and sent down through multiple crushers and sorters to separate regular rock from valuable copper. From the base, it was loaded onto trains that followed tracks (now the McCarthy road) for shipping out of the state. $200 to $300 million in copper and silver was taken out of the surrounding mountains between 1911 and when the plant was shuttered in 1938. Morning in bustling downtown McCarthy. 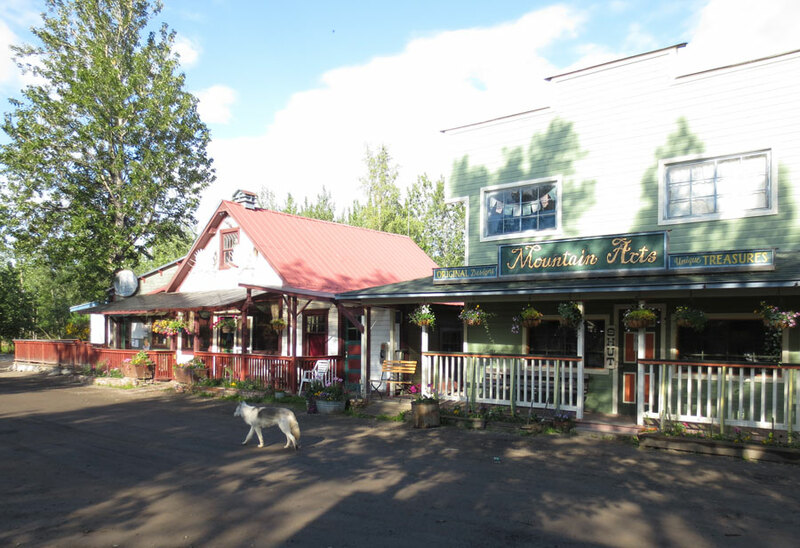 Just a 5-mile shuttle ride away is the town of McCarthy. While Kennecott is owned and maintained by the National Park Service, McCarthy is a normal, tiny town that contains lodging and dining/drinking options as well as a hardy bunch of locals who call the place home. Around 30 people live here year-round, but the population increases during the summer season with visitors and seasonal workers. Even with the increase, I wouldn’t call the area heavily populated, so you won’t be feeling crowded. Hotel options are few this far from civilization and as a result are expectedly pricey. For an economical option we chose Lancaster’s Backpacker Hotel, which offers simple accommodations with bunk beds in the rooms and shared bathrooms downstairs. Again there are no locks on the doors, but fear not, because nobody who takes the time and energy to get to McCarthy has any interest in stealing your iPad. A brief walk around town revealed fun loving locals at the Golden Saloon, friendly dogs trotting around town greeting visitors and picturesque rusting trucks from decades past. It obviously takes some effort to get stuff in and out of here. Both mornings we were in town we enjoyed breakfast at The Potato, a little screened-in shack serving breakfast lunch and dinner. The breakfast options were tasty and they have great coffee. For our picnic lunch we stopped by the McCarthy Center Store and bought deli sandwiches to go. For a casual dinner we loved the Golden Saloon with its gastropub-ish menu and great beer list. They offer live bands most nights, but we found plenty of entertainment just sitting on the outdoor patio with a beer watching McCarthy life pass by. Right next door (connected actually) is the McCarthy Lodge, which is a well known fine dining destination. It is highly recommended by the Michelin Guide, Bon Appetit and Food & Wine Magazine among many others. The night we were there featured a 3-course chef’s menu for only $38. It’s a wonderful surprise to find this kind of dining at the end of a 62 mile gravel road and it really hit the spot after a strenuous 9-mile hike up and down a mountain. Abandoned Buildings at Bonanza Mine site. 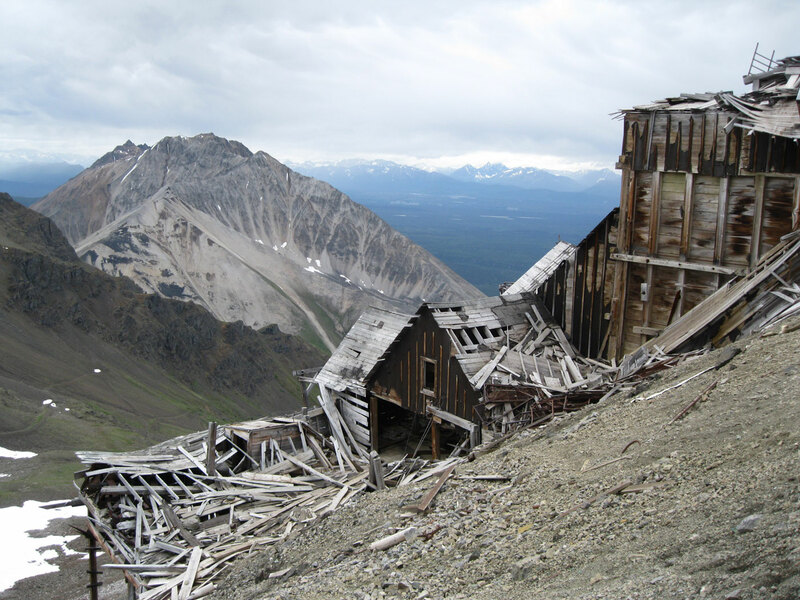 On the subject of hiking, Wrangell-St. Elias provided us with probably the most strenuous and spectacular single hike of the trip, the Bonanza Mine Trail. Starting at the mill in Kennecott, the trail rises 3,800 feet in 4.5 miles to the site of the abandoned Bonanza Mine, which was connected to the mill by tram. There are many visible relics of the mining days littering the sides of the trail especially at higher altitudes. The trail starts out moderately steep, but gets continually steeper the higher you go, with the last push seeming nearly vertical. Trekking poles really helped out on this hike, I highly recommend them. At the top of the trail the remains of the mine buildings and bunkhouse are mostly piles of timber at this point. Views stretch to the Kennicott and Root Glaciers below and on clear days you can see 16,391 ft. Mt. Blackburn. 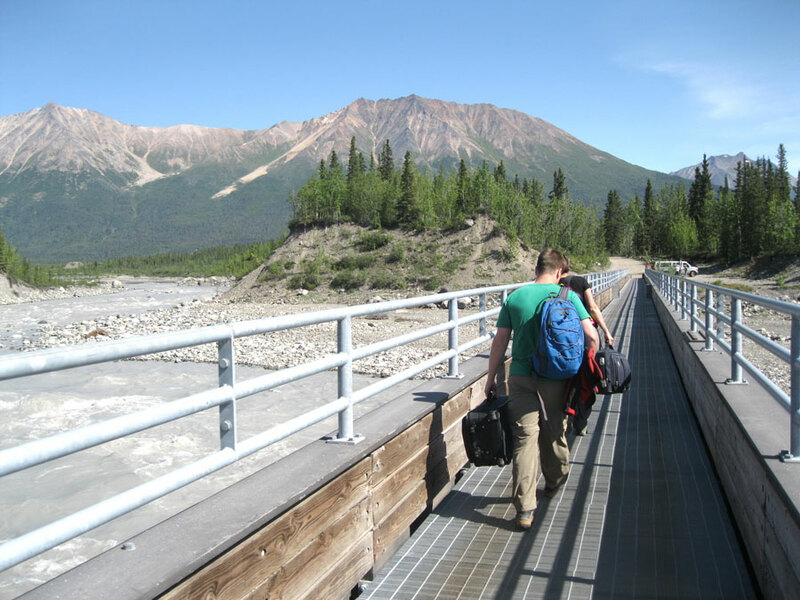 Wrangell-St. Elias may have been our favorite overall National Park experience in Alaska. The combination of remote isolation, history, hiking and unexpected dining made it the perfect place to experience authentic Alaska. After a day of travel back down the McCarthy Road and the Glenn Highway to Anchorage, the road trip portion of our adventure ended. The next day, Emily and Jake headed back to Iowa while we made our way to the watery southeastern panhandle of the state. This entry was posted in Destinations, Travel Resources and tagged Bonanza Mine Trail, Flat Tire McCarthy Road, Kennecott Mill, McCarthy Golden Saloon, McCarthy Lodge, McCarthy Road, Tonsina River Lodge, Willow Lake B&B, Wrangell St. Elias National Park. Bookmark the permalink.